While key details behind Pritzker’s tax plan are still under wraps, new information reveals it relies on outlandish assumptions about Illinois’ economic growth. After a full week of withholding details about the math behind his graduated income tax plan, the Pritzker administration on March 15 sent some of their assumptions to the Illinois Policy Institute in a one-page summary. While still refusing to release key details, Pritzker did reveal some of the politicized math he used to make his plan an easier sell. Specifically, he relies on overly optimistic assumptions about the state’s growth, which means the governor will have to enact higher taxes than he proposed in order to generate his desired revenue. Because Pritzker’s income tax plan would not go into effect until 2021 at the earliest, his administration makes assumptions about how much Illinois incomes will grow between 2016 (the most recent year of publicly available income tax return data) and 2021. If Pritzker assumes that growth is extraordinarily high, he can claim his tax plan raises more money than if he uses a more reasonable estimate and thus promise modest tax cuts. He can also claim he’ll have a smaller deficit to paper over. The limited release from Pritzker’s office shows that’s exactly what he did. Pritzker’s plan assumes Illinois will see average annual income growth of 3.61 percent. His administration claims this “conservative” estimate is both consistent with the state’s recent performance and accounts for a one-year stagnation in income growth to account for a slowing economy. But Pritzker is wrong on both counts. According to the IRS, the average annual growth rate of Illinois’ adjusted gross income over the past five years of available data has been 3.37 percent, meaning the administration fails to correctly account for the past. The governor also alleges that a one-year stagnation of income growth in his assumption is “conservative” and accounts for an economic slowdown. But Illinois’ total income has not only stagnated, but declined in two out of the past four years on record. Not only are the governor’s assumptions wrong given the state’s recent performance (which he states are the basis for his claims), but they are wrong given the anticipated growth trajectory of Illinois and the U.S. economy as a whole. The governor’s estimates don’t account for the possibility of a slowdown or even a recession, which two-thirds of business economists in the U.S. expect before 2021, according to polling from the National Association for Business Economics. In the likely event of a recession, the revenue generated by Pritzker’s plan is bound to come up short, meaning the governor will have to raise rates to generate his desired revenue. When employing one of the most widely used models for forecasting GDP growth, the data show Pritzker’s administration could be overestimating Illinois’ total adjusted gross income in 2021 by $14 billion to $32 billion (see appendix for methodology). This forecasting model matches the past performance of Illinois’ economy, thus providing reliable estimates of what economic growth will be in the future. These projections do not account for a recession. 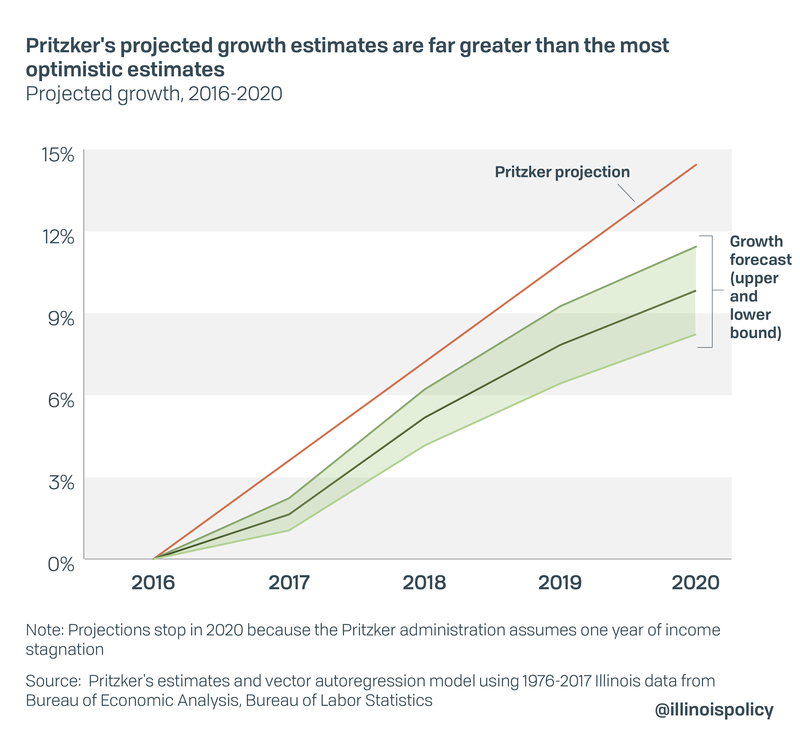 Even under very optimistic assumptions about future growth, Pritzker’s growth estimates are still far beyond any reasonable projection. Because of the governor’s rosy projections for future growth in the Illinois economy, his expected tax collections are overstated. 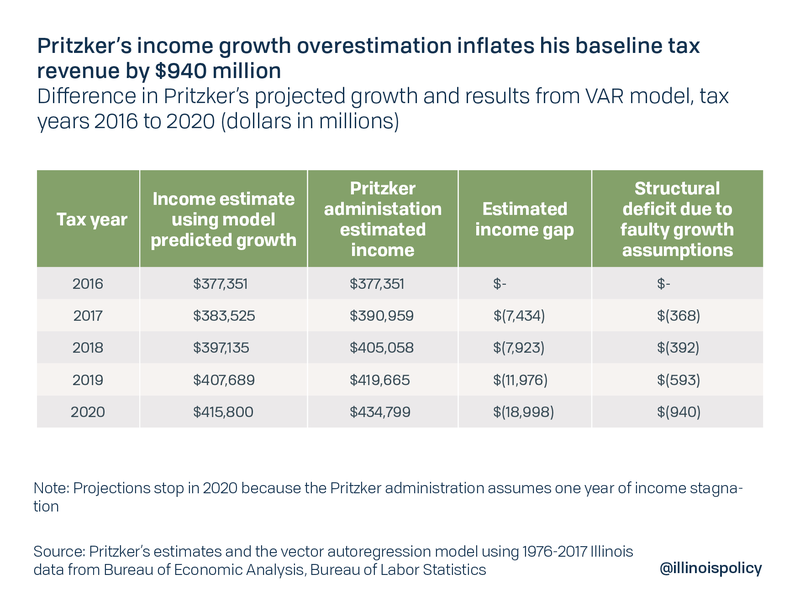 Pritzker would need to increase the size of his tax hike in 2021 by nearly $1 billion simply to cover the difference between his assumptions and a more reasonable growth estimate. The current projection for the 2021 budget deficit is $3.3 billion. However, Pritzker’s faulty revenue assumptions are likely underestimating the size of the deficit. If the governor used more realistic assumptions about the growth in Illinois’ income and future tax collections, the structural deficit for 2021 would grow by $940 million, bringing the deficit to $4.2 billion by the time a graduated income tax hike could take place. 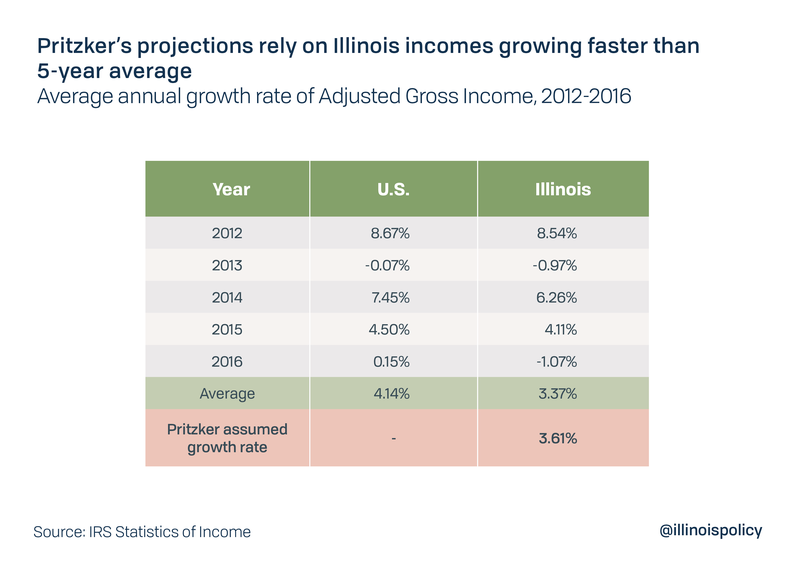 By using outlandish projections for income growth, the administration alleges that a graduated income tax plan is capable of bringing in an additional $3.4 billion while still providing tax relief to 97 percent of Illinoisans. Unfortunately, because the governor’s baseline is far off, his plan will not deliver on his promise of closing the structural deficit. When his plan ultimately fails to bring in enough revenue, he will have to raise taxes on middle-class Illinoisans. Pritzker’s proposed fiscal year 2020 budget was already criticized by S&P Global Ratings for relying on overly optimistic revenue projections. His tax plan is no different. In fact, Pritzker’s baseline tax collection estimates are $1.9 billion to $2.5 billion higher than the Governor’s Office of Management and Budget projected in November 2018. One reason is that GOMB included a three-quarter recession in its estimates, based on economic projections from analyst group IHS Markit. The administration still has not provided the number of tax filers they assume are going to be in each tax bracket in 2021, making it impossible to fully analyze the governor’s plan. Because Pritzker does not disclose his estimates for the number of tax filers, it is not clear whether his plan takes into account population loss, which is likely to depress long-run economic growth. Illinois is the only state in the nation amidst five consecutive years of worsening population decline. The Illinois Policy Institute has filed a Freedom of Information Act request seeking these details, as well as the basis for changing the growth forecast from GOMB’s November 2018 projection. Pritzker’s goals ­– healthy state finances, a strong economy and a tax cut for the middle class – cannot be achieved by the means he’s proposed.